Here's a superb new online slots game that you must not miss. Rainbow Ryan by Yggdrasil Gaming is a new slots game with a hybrid theme. It’s a Rock genre-Irish theme – think amplifying rainbows and a groovy leprechaun. However way you’d like to categorise it, Rainbow Ryan is the refreshing twist that Irish themed slots required. This spin to win slots has 6 reels, and 4096 ways to win. It has the standard Wild and Scatter bonuses and a pretty awesome Rainbow Reel Feature. All in all, we’re happy to see Leprechaun Ryan trade in his fiddle for an electric guitar! If you love promo's, get the best top-rated slot bonuses today. Rainbow Ryan has taken a clichéd theme and made it unique. 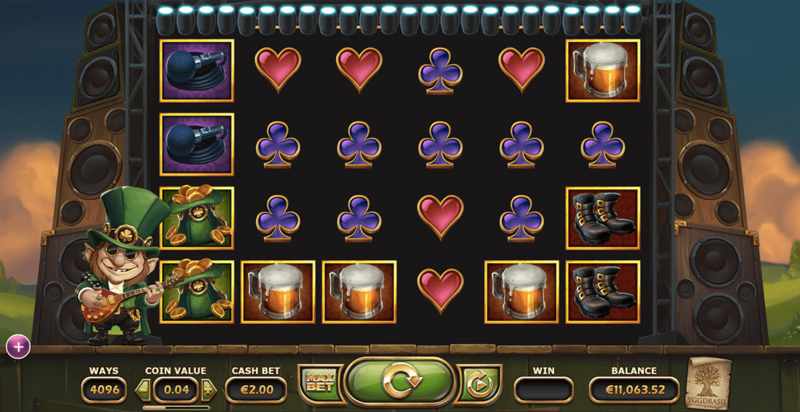 Ryan is a leprechaun which explains the rainbow but it bears little resemblance to the other Irish themed online slots. For one, Rainbow Ryan is set on a stage that looks like it belongs in a rock concert, and the music further adds to the rock genre feel, and to top it off Ryan carries an electric guitar that he uses to announce your wins. The symbols on the reels include the 4 card suits – Spades, Hearts, Clubs, and Diamonds – and the rock n roll leprechaun’s belongings like beer, boots, microphone, and lucky hat. This online slots game offers you a whopping 4096 ways to win! Rainbow Ryan hence does not have too many Bonus Rounds and Features but the few that it does have are pretty impressive. The Wild Symbol in Rainbow Ryan is easy enough to spot, it has the word ‘WILD’ written in shiny gold against a bottle green background. The Wild can replace all the symbols with the exception of the Scatter. The Scatter Symbol is presented as a symbol that reads ‘Free Spin.’ The number of Free Spins you win corresponds with the number of Scatters you land. This online slots game has a Rainbow Reels feature that gets triggered randomly. When the funky leprechaun chooses, he will sync anywhere between 2 to 6 reels to display the exact same symbols. This will significantly increase your chances of landing a winning combination. Another benefit of this feature is that it is not only in effect during the base game but also during the Free Spins. Once the reels are synchronised, the number of synced reels can only increase – meaning if you have landed 3 synch reels, the next number of synced reels has to be more than 3! 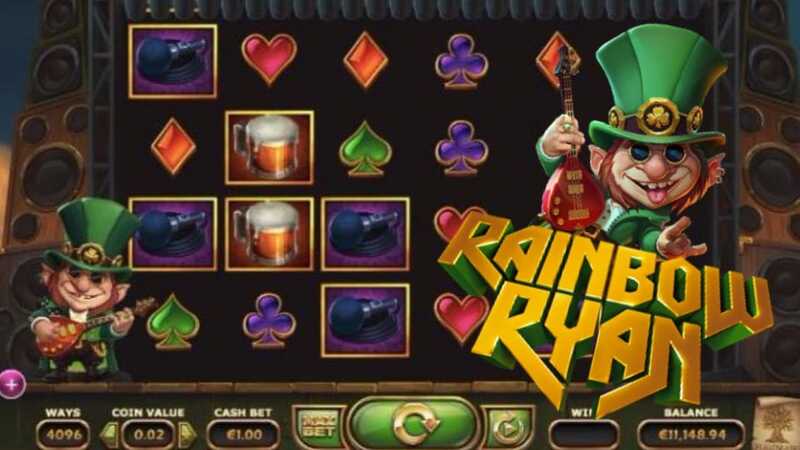 Rainbow Ryan is a rock n roll version of a traditional Irish luck themed slots theme. Ryan is too quirky not to love, the soundtrack is great, and if you are patient they returns can be huge. Yggdrasil, you’ve done it again!